Stay well-hydrated by drinking at least 8 cups (64 ounces) of water each day. Water is fine. So are fruit juices, soda, and electrolyte beverages. You may want to stay away from caffeinated drinks, because caffeine is a diuretic. Drinking water or juice will prevent dehydration and help thin the mucus, thus keeping it flowing freely and making it easier for the body to expel, along with the viral particles trapped within it. Resting when you first come down with a cold or the flu helps your body direct its energy toward the immune battle. Staying away from work may be a good idea from a prevention standpoint, too; your coworkers will probably appreciate your not spreading your cold virus around the office. Use saline nasal sprays or make your own salt water rinse to irrigate your nose. Salt-water rinsing helps break nasal congestion while also removing virus particles and bacteria from your nose. Here’s a popular nasal irrigation recipe that you can try at home: Mix 1/4 teaspoon salt and 1/4 teaspoon baking soda in 8 ounces of warm water. Use a bulb syringe to squirt water into the nose. Hold one nostril closed by applying light finger pressure while squirting the salt mixture into the other nostril. Let it drain. Repeat two to three times, and then treat the other nostril. Note: Distilled, sterile, or previously boiled water is recommended for purity and safety. Be sure to clean and dry the neti pot after each use to prevent the introduction of harmful bacteria into the nasal passages/sinuses. Steam can help to relieve stuffiness and congestion. Hold your head over a pot of boiling water and breathe through your nose. Be careful. If the steam burns your nose, breathe in more slowly. Another remedy is to add a few drops of oil of eucalyptus (Eucalyptus globulus) or menthol to the water. Eucalyptus is known to open up bronchial tubes, ease congestion, and make breathing easier. Gargling can moisten a sore throat and bring temporary relief. This natural home remedy is very effective in winter. Chicken soup has many essential nutrients and vitamins that help treat common cold symptoms. Hot chicken soup is a potent mucus stimulant, especially when it’s loaded with pepper, garlic, hot curry powder, or other pungent spice that helps to thin mucus in the mouth, throat, and lungs. Chicken soup also helps your body better fight against its viral invaders. For best results, make homemade chicken soup using organic vegetables and chicken. Vitamin C is one of the most effective natural remedies in treating a cold because it increases the production of white blood cells, and can also help prevent the multiplication of viruses while reducing mucus and inflammation in the nasal passageways. Fresh squeezed lemon is a good way to naturally supplement vitamin C levels. Drink hot lemonade three to four times a day throughout your illness. Garlic may be known to ward off vampires, but it can also ward off colds and flu. It is best seen as a preventative. The use of garlic against colds and flu seems to be most effective when taken before the infection is caught, or immediately the symptoms begin to show. As always, discuss any treatment with your doctor – garlic can interfere with the working of certain medical drugs. For more information about Garlic, click here. 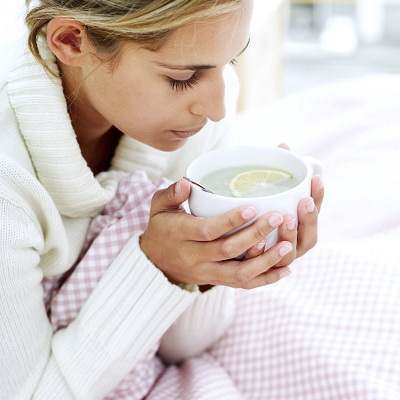 The truth is many of the old standard home remedies, when used regularly and properly, can be your body’s best – and least expensive – defense against colds and the flu, but if the cold lasts longer than two weeks, you should consult a physician, If you have the flu, seeking treatment from your doctor within the first 48 hours. Please refer to the Difference between flu and cold symptoms.